The Center for Disease Control (CDC) in the U.S. has established December 2nd through the 8th as National Influenza Week for 2018, in order to highlight the importance of being immunized against the flu, during the holiday season and afterward. Professional caregivers echo this sentiment, in Stanwood and elsewhere, because they understand just how important it can be to seniors to receive that annual flu shot. If you have a senior loved one in your life, you should encourage them to get their flu shot at the earliest possible time, so as to stave off the harmful effects that it can cause. You might be surprised to learn just how dangerous it can be for an elderly person to come down with the flu. The first thing to be aware of with regard to seniors catching the flu is that their immune systems are almost always less effective at age 65 and above, compared to younger individuals. That means they are much more at risk of contracting the disease, simply because they are less capable of defending themselves against it when exposed. The symptoms of influenza are bad enough by themselves, but they carry an increased risk of other medical conditions as well. Having the flu increases the risk of also having a heart attack by between three and five times the normal rate, and it increases the risk of undergoing a stroke by two to three times the normal rate, especially during the first two weeks following infection. That risk gradually reduces over the next several weeks, but the point is that there is still an elevated risk of having either a heart attack or stroke for any senior who develops the flu. The bottom line is that any senior who contracts influenza has a six times greater risk of dying either from the disease itself or from other complications resulting from it. In addition to the reduced effectiveness of their immune systems, there are other reasons why seniors are in the age group most strongly impacted by the flu. Even several months after contracting the flu, seniors are still at a significantly increased risk of having a heart attack, stroke, and other cardiovascular issues because there is lingering inflammation, as well as a greater risk of blood clots forming as a result of the flu symptoms. Even if no heart problems develop whatsoever in a senior, it is still entirely possible that during the period after having suffered from the flu, any given elderly person is unable to achieve the level of good health enjoyed prior to contracting the disease. A study which included more than 250,000 senior residents of nursing homes showed that after having suffered through an attack of influenza, elderly victims were unable to recover some of the needed skills for bathing, dressing, eating meals, and going alone to the bathroom. These results hint strongly that the impact of influenza on seniors may be permanent, which is a frightening thought. 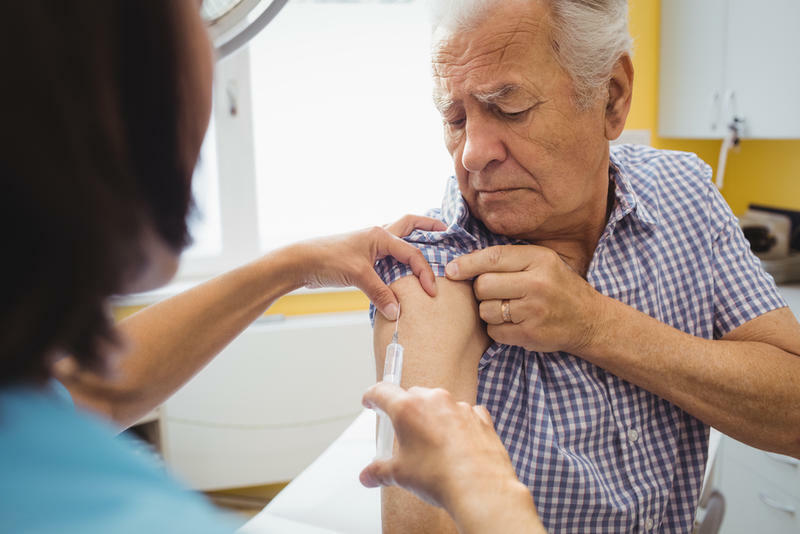 While vaccination against influenza is not 100% effective, there are vaccines specifically developed for seniors which are generally highly effective at preventing the onset of symptoms, as well as all the other possible related complications. Many seniors have avoided getting an annual flu shot in the mistaken notion that they simply are not as effective as vaccinations for younger people - but statistics disprove that thinking. In fact, statistics bear out the fact that seniors immunized against the flu are three times less likely to contract the flu than those who are not immunized at all. Vaccines which are specially prepared for seniors can significantly boost the immune system's response, and energize the body's defense system. Adjuvanted vaccines are preparations designed for just this purpose, and they include an extra ingredient called an adjuvant such as MF59, which triggers a more active immune system reaction to an invading disease. This adjuvanted flu vaccine is called FLUAD, and it has been shown to be very effective at preventing the onset of flu symptoms when administered to seniors. There are now more outlets offering free flu shots than ever before in this country, and they are available in nearly every community. This includes high-dosage vaccines and adjuvanted vaccines prepared for elderly persons, and the supply of flu shots has been adequate to meet the demand for the past several years. In communities where flu shots are not offered on a no-charge basis, they are paid for by Medicare, so there is no excuse for any senior to avoid getting immunized. Anyone who has an elderly parent is strongly encouraged to ensure that your loved one is vaccinated against the possibility of contracting influenza, so they can make it through the flu season, and emerge healthy and strong in the new year.